To learn more about and / or to report a scam email, click here. Seller, beware! From time to time you might receive suspicious inquiries about purchasing your bass. It's usually similar to the "Belgium music lessons" scam. The would-be purchaser sends you a check for more than the amount you are asking. He'll usually offer you something for your trouble, tell you to cash the check and then wire part or all of the overpayment back to him. The check is counterfeit, but by the time your bank notifies you of that fact, you've wired away your own money, which you may not be able to recover. The seller may also request that you take down your ad because you have sold the bass to him. If you receive a suspicious check in payment for an item for sale, have your bank guarantee its authenticity first, in writing if possible, and wait not only the funds to be deposited to your account, but also for the check to actually clear your bank. When in doubt, cut off all communication with a suspicious buyer. Do not engage in conversation, email or otherwise. You can also notify your state's attorney general or the FBI of a possible email scam. To make minor changes to an existing ad (i.e., change Asking Price), please contact . To protect the privacy of the sellers below, you must either login as a member or fill out the CAPTCHA phrase below. Phone / Email: Please login as a member or fill out the CAPTCHA phrase above. Rib depth: 8 - 8 5/8"
Additional Description: The instrument’s only identifying label is a small piece of paper bearing the serial number "CON228" and is glued to the interior back. The instrument is likely of French origin and dates to the early part of the nineteenth century. The scroll bears German tuning gears, which are believed to be original, and an extension made by Ben Joella of Palm Beach County, FL. 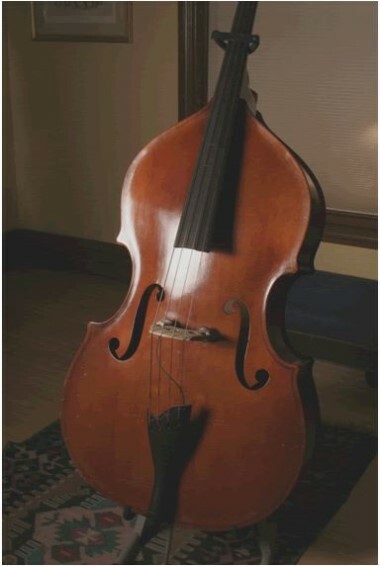 Restoration work was completed by Michael F. Magee in 2007, and all subsequent work, including a replaning of the fingerboard, a new bridge, and sound post, has been completed by Robertson’s Violin Shop and Trevor Davis. The instrument has won orchestral jobs in the Florida Orchestra, the Pittsburgh Symphony, as well as positions in the New World Symphony program and at Rice University. 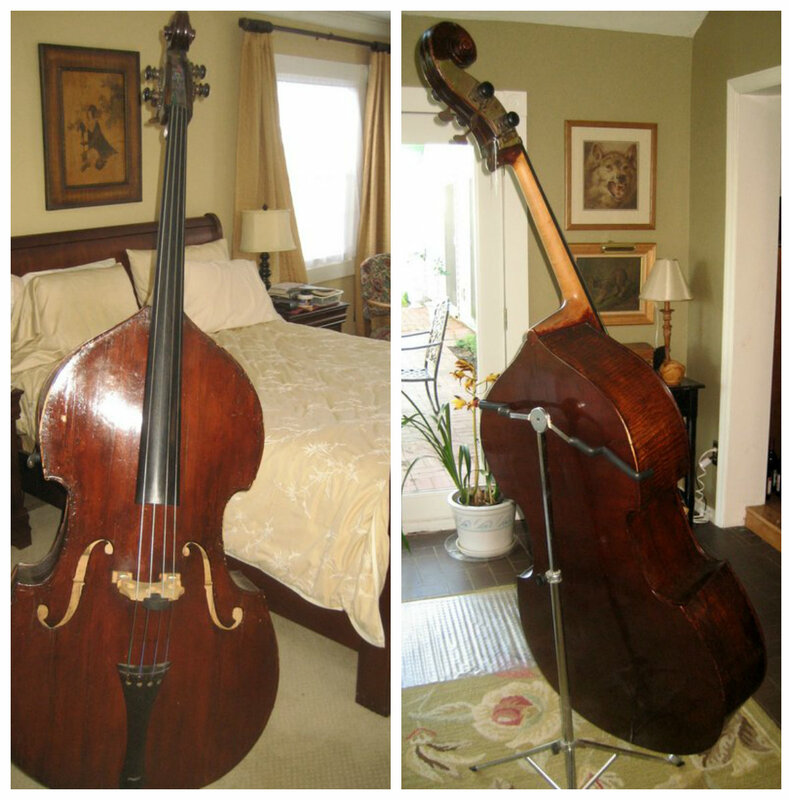 Additional Description: Asking $9,000 for a bass appraised @ $16000. Currently has spiracores. Ebony fingerboard, Spruce top, Maple back, and Beachwood neck. Appraised in 2004 for $16,000.00 by world renowned Luthier Scott Henry, in Chicago IL. Was routinely serviced throughout the years as well. Well cared for and in excellent condition. Has a David Gage Realist pickup installed. D neck. Also selling a Seifert german bow for $600 on its own (will include with bass for free). Please email me for additional pics or more information. 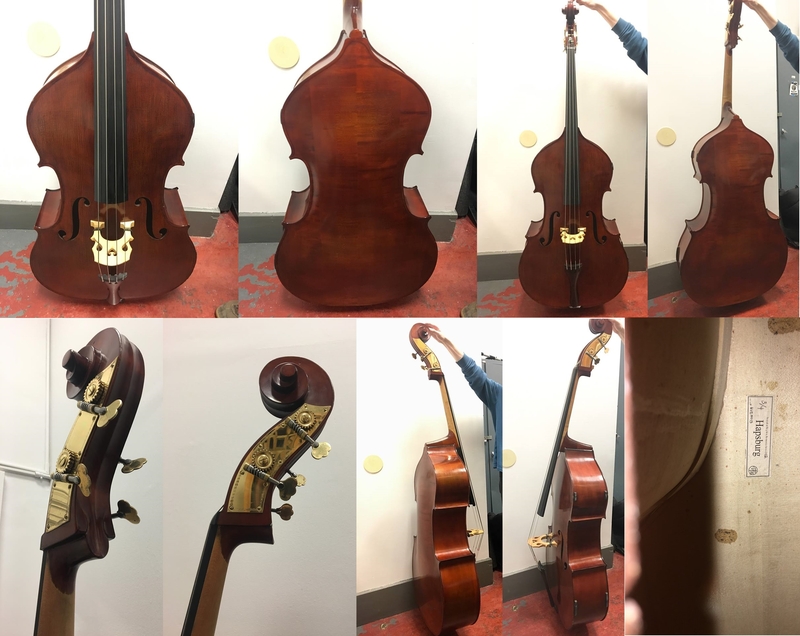 Additional Description: Performance Capacity: Over the past 40 years, I have used this bass for solo, orchestral, and chamber music as a music major at Temple University, and then for big band and small group jazz gigs in the Philadelphia area. This fully carved bass has been set up by Mike Shank at Shank’s Strings and is easy to bow and has a warm, even sound for both pizz and arco. Additional Description: Plywood.Excellent Setup and Condition, Pirastro Evah Pirazzi strings, Full Circle pickup, Mooradian Bag Original owner, professionally played and maintained. Excellent condition and setup with new ebony fingerboard, bridge, tailpiece, endpin. Pirastro Evah Pirazzi strings, Full Circle pickup, Mooradian bag. Professionally played and maintained for many years. Additional Description: Appraised by Lisa Gass for $17,000. Details:7/8, adjustable chromatic C extension redressed 2019, new nut, bridge, fingerboard and setup work by Keiran O'Hara 2019. $11,500 priced for quick sale! Comes with gray Mooradian cover. Additional Description: Made by Gunter Krahmer of the Pollman family styled after Maggini. Body length 44.75" with rib width just under 9.5" Comfortable string length of 41.5". Projects evenly across range. Carved back and sides highly flamed. Top has “bear claws”. 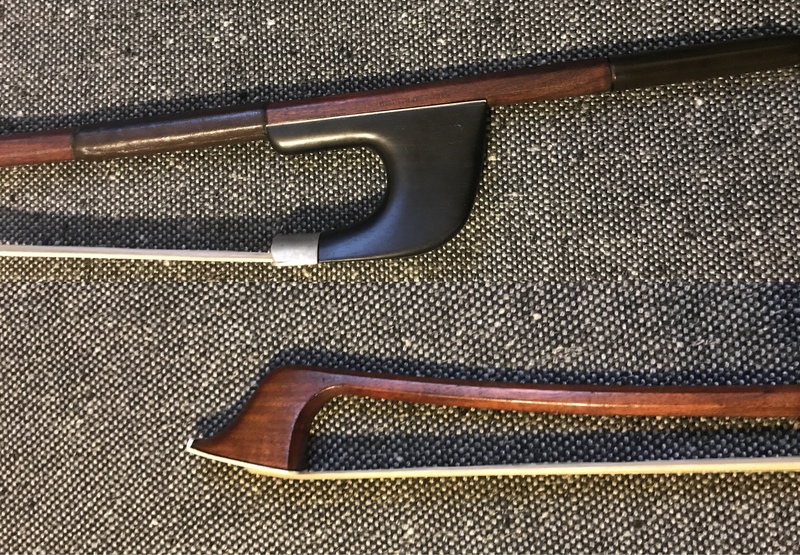 Premium endpin, rosewood tailpiece, high saddle, ultra thin violin corners, double purfling. Cushy soft case. Kolstein’s label partially pasted over Krahmer’s. Superb condition. Additional Description: Beautiful HR Pfretzschner German bow. Older octagonal pernambuco stick that pulls a clear, complex sound. Has a nice, quick response for orchestral playing and a strong, focused sound for solo stuff. Has been used professionally and is really a wonderful do-it-all bow. Weight is 129 grams and usable hair length is right around 21 3/4". Has the HR Pfretzschner stamp on the stick and the faded coat of arms stamp on the frog. Happy to ship for a trial period to anyone seriously interested. Additional Description: Known audition winner! This is a one of a kind bass made by famed luthier Jon van Kouwenhoven of CT. Removable C extension and all set up and maintenance done by Jed Kriegel. Warm and deep tone and very responsive, solo fingerboard, one piece poplar back, poplar sides and spruce top. This bass has won me many auditions and gigs over the years. 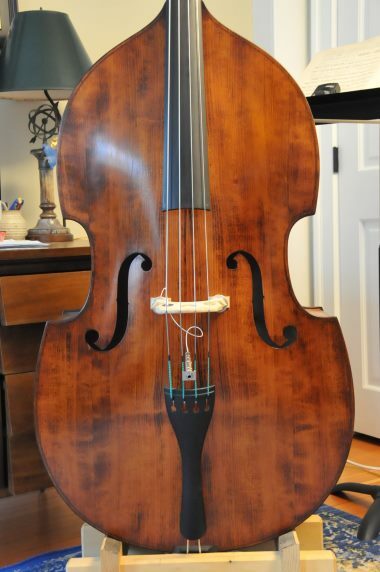 Additional Description: A wonderfully playable bass. Sloped shoulders allow for ease of playing. Tone is smooth and clear in all registers. Great volume and projection. Low C extension. A well-made and beautiful instrument for this price. 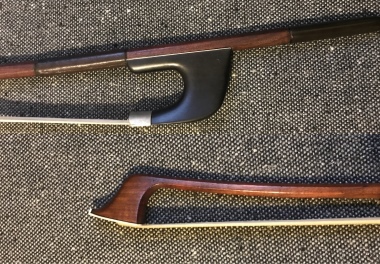 Additional Description: German bass bow made by Steffen Kuhnla. Pernambuco stick, ebony frog. Pulls a broad, powerful, consistent sound. Additional Description: Very good condition, only a few old top cracks all well repaired and solid - recently examined by top bass luthier. Has custom fingered 'C' extension and Sloan tuners. Lovely, even, very open, projecting sound. Easy to play with excellent access to upper register. UB-19 3/4", LB-25 1/4", Ribs-6 3/8" at top to 8 3/4" at bottom. Additional Description: Nice sound for both orchestral and jazz. German origin circa 1830. Belly is of pine. Two piece back is of plain maple with no purfling. Ribs and scroll are of plain maple. Neck is of birdsye maple. Tuning gears added later: brass 1/2 plate of French origin. Adjustable bridge: pernambuco. The bass is in good and healthy condition. Mooradian Standard bag and bass stand included. 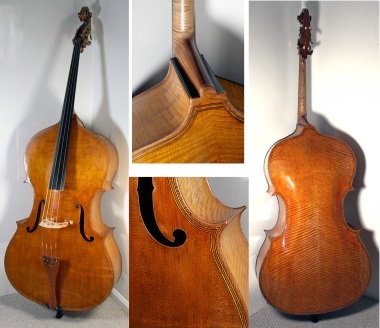 Additional Description: A fine Hungarian double bass, labelled “Castello Della Musa”, made for Music Messe, Budapest anno 2002 after Giovanni Paolo Maggini, ¾ size. The back is formed from two pieces maple, showing attractive medium width flames slightly descending from centre joint. The ribs are of matching maple, neck and scroll of maple with less regular broader flames. The top is of spruce having fairly even medium width grains, broadening toward the edges. Varnish is a medium orange brown colour on lighter ground, slightly old imitated. The instrument is in fine condition. Length: 1115 mm. Width, upper bouts: 502 mm. Middle bouts: 362 mm. Lower bouts: 660 mm. 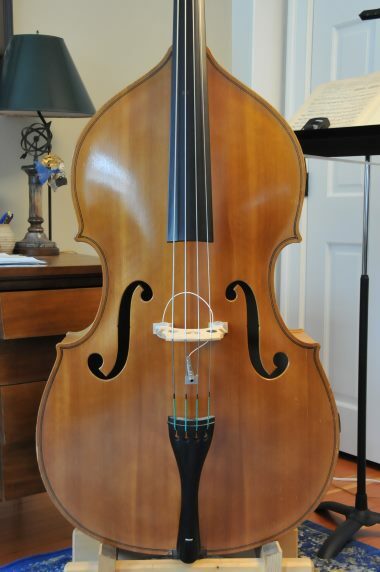 Additional Description: Fully carved bass made in the 1950s. The label inside reads "Made in West Germany." This bass comes with a Fishman Full Circle pickup installed into adjustable bridge with a 1/4" jack mounted to tailpiece. Mooradian Standard Double Bass Bag included. Additional Description: Instrument is sound with superficial blemishes. I inherited this from family and I am not knowledgeable about basses. Click here to view the Appraisal Note. 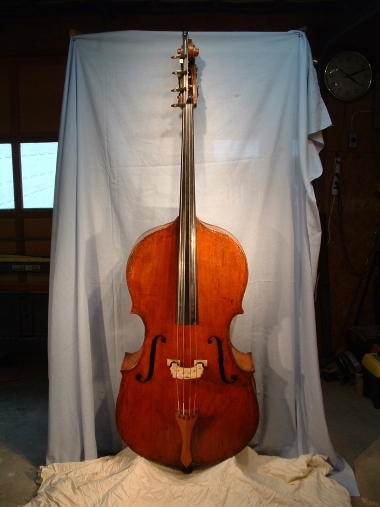 Additional Description: Abraham Prescott bass made in 1834 in Concord, New Hampshire. 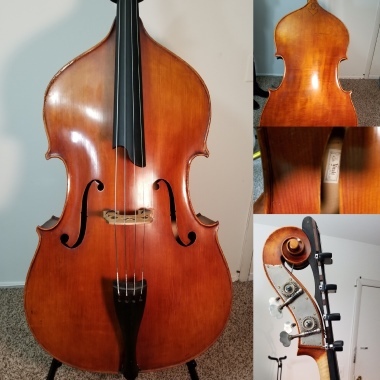 Has the original label, beautiful instrument with a huge sound played in the Dallas Symphony Orchestra for several years. 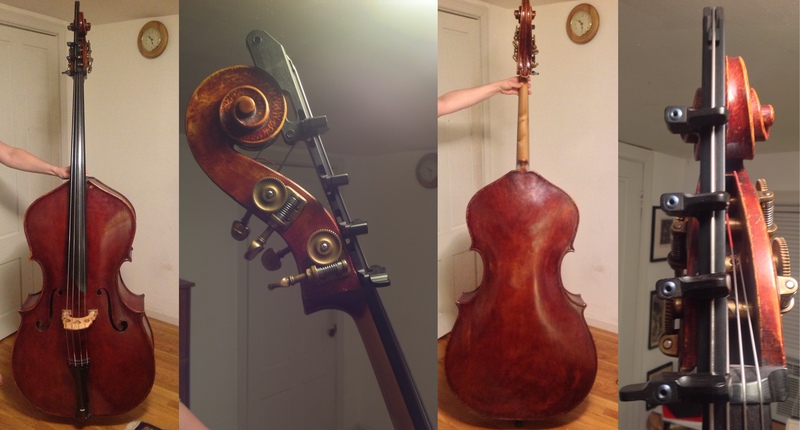 The bass is now located at the Guarneri House in Michigan. Additional Description: A great orchestral instrument that has a beautiful deep and clear tone that projects fully to the back of the hall. The measurements are: Overall height 73.5", Body height 45.25", Upper bout 21.75", Lower bout 26.75". 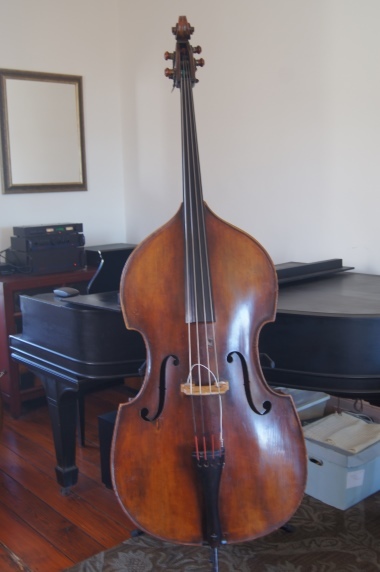 This bass is in fantastic shape and has a big, booming sound that has served me well in my orchestral work for many years. More pictures upon request. Additional Description: Seth Kimmel’s Gamba model, with back and sides of walnut and an Engelmenn Spruce top. 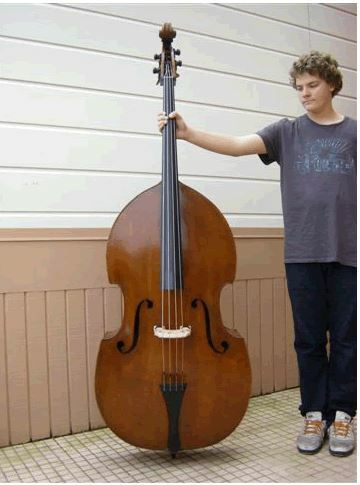 This is a great bass by a fantastic maker! 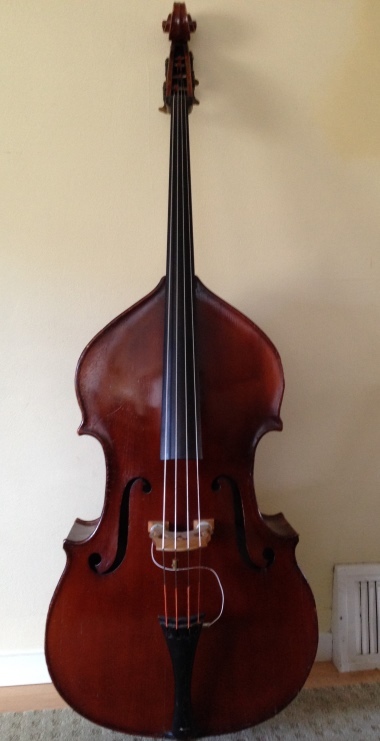 The bass is incredibly easy to play due to its small sloping shoulders. It is responsive and even all over, with a clear projecting tone. This bass is incredibly articulate and packs plenty of punch to provide clarity in a big space while still keeping a big, beautiful sound. Additional Description: Beautiful double bass, 7/8 size made in Tyrol (Germany) circa 1875. It has a great woody sound that is ideal for jazz playing. Due to the angle of the fingerboard and the scroll, it cannot accept an extension. Top is medium grained spruce. The flat back is made from flamed maple wood of light curl. The varnish is of golden brown color. Well restored, authentic and excellent condition. Additional Description: Nice Carved early 20th Century German Made Bass. Huge, Full Sound. No Major Condition issues. Presently set up for a Jazz Player. Nice Maple Back. Seller is on West Coast. Seller is open to reasonable offers. Additional Description: This Kay has received the benefit of extensive luthier work, which is reflected in its price. Work done by the Gage shop in NYC and Canyon Music Woodworks in southwest Colorado. The neck has been off (though never broken!) and reset twice, eliminating all of the dreck that is usually in Kay neck joints. The fingerboard is excellent ebony, properly dressed, and the bridge is a best quality Aubert. Pecanic tailpiece. I have never seen another Kay of this age in this condition. Used at home only for the past 15 years; possibly gigged in New Orleans a long time ago. Obligatos are on it now. Additional Description: Not Francois but his son, Olivier Rabbath, has designed this new DOUBLE BASS FLIGHT CASE weighing only 35 lb(15.87kg) and made of kevlar and carbon for strength and durability. Inside, Rabbath has developed a unique "suspender" system that cradles the instrument five inches from the walls of the case. Click here for purchasing information!